... but if he carries on like this, it won't be long before he falls off! He's lost 99% of his fluff and is looking just like a juvenile peregrine should do, having a tawny coloured underside with vertical blotchy streaks. He will have this plumage until he is about 10 months old when he will start to get his full adult feathers. Paddington is now growing so fast that it is difficult for camera 1 to do justice to him as it is so close! Here is a clip from camera 2 - not the best viewing angle though. Paddington's flapping is now rather vigorous and it probably won't be long before he either flies off the tray, or more likely falls off! So, if you want to see him easily, then the next few days will probably be the last opportunity to have a good look at him on the tray. After he leaves the tray, then he should be visible around the Abbey while he is fed and taught to hunt by his parents. This means that the cameras will no longer be recording his day to day activities but I will try to keep the blog up to date with any sightings. Paddington is rapidly losing his fluff and gaining lots of feathers! He has also been practicing flapping his wings. It's been rather hot again, and Bella has been trying to keep Paddington cool. The problem is that he is now nearly as big as his mum, and there isn't much shade to sit in! In the same way that his dad CR has a name taken from children's literature, Christopher Robin, PDN's name had to come from another famous character with the same letters. 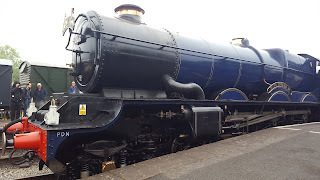 The cryptic clue in the last post relates to the three letter code which Brunel's Great Western Railway used for its locomotive depot at Old Oak Common near to its London Paddington terminus. 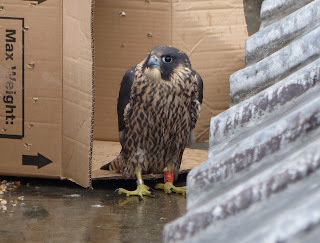 By the way, the leg ring with these letters was chosen from a bag that the Gloucester Raptor Monitoring Group brought with them when he was ringed. It's just a coincidence that the three letters allowed for this name! Anyway, Paddington is now 32 days old and as you can see is very active. His white fluffy down is receding, and as his feathers grow, he is starting to look more and more like a peregrine. On a more serious note, it has been reported that a drone was seen flying near the Abbey tower last Friday, July 6th. Peregrine Falcons are a highly protected species, and it is an offence to fly a drone anywhere near an eyrie between 1st February and 1st September each year. Also, drones must never be flown within 50 metres of a person, vehicle or building not under the pilot's control. It's been a week since PDN was ringed. Here is Tim lowering himself down the tower. and then PDN returning, none the worse for his encounter. The unhatched egg was also removed. Watch this space for the announcement about PDN's (unofficial) name! It's official - PDN is a male! His name has yet to be chosen, but there are a couple of front runners. If you have any appropriate suggestions (and reasons if possible) please use the comment box below. Today was a very important day! 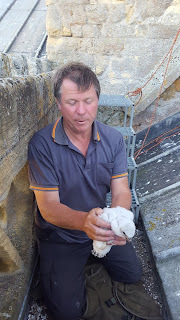 The chick has been ringed, and now has an identity of its own. 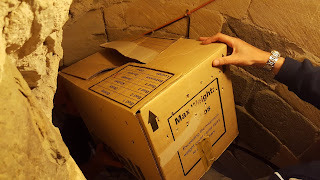 This is the only way that its progress can be followed once it leaves the nest, and allows the peregrine population as a whole to be monitored. The process was carried out by members of the Gloucester Raptor Monitor Group. When he reached the nesting tray, Tim gently picked up the chick, and with it safely stowed inside a tightly bound rucksack, it was lowered to the roof below. Rob (the licensed ringer) was at hand to get it out of the bag. and a plastic one on the left leg. This ring has larger and more visible writing allowing it to be read from a distance. After this, some measurements were taken and it was weighed. We don't yet know whether PDN is male or female. This can be determined from the measurements and weight data and Rob will let us know in due course. Once we do know, then PDN will of course need a real name. I do have a couple of ideas however, please feel free to make your suggestions in the comments link below!